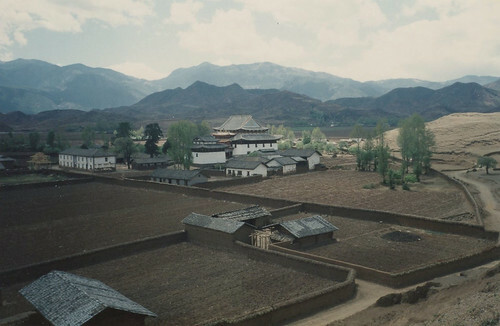 Joseph Rock in Yunnan and Sichuan: Chapter 27: YONGNING: First Sighting Of the Muli Peaks. 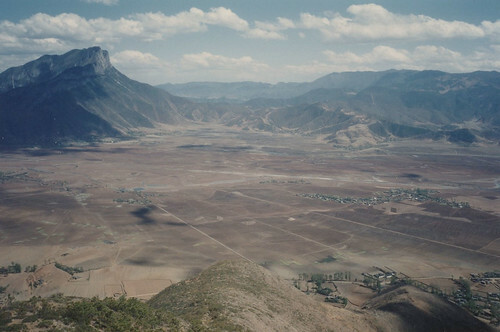 Chapter 27: YONGNING: First Sighting Of the Muli Peaks. Just before I arrived in Yongning, I came across my first signs of Tibetan influence: a silver dagger that somebody had dropped on the road. I pocketed it and carried on my way. 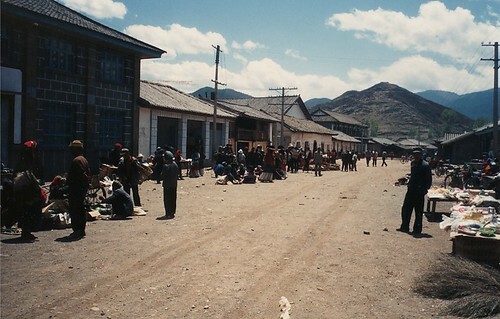 In 1924, 'Youngning' had been the capital of the Lushi tribe, ruled by three chiefs descended from Mongols appointed by the Kublai Khan. Joseph Rock passed through the place on his way to Muli, with his mute caravan and ten Nakhi soldiers and porters. He had already spent six days in the saddle, travelling through leopard-infested forests and the Yangste chasms, whereas I had made a more roundabout two-day trip by bus. Rock was to meet no Chinese during the whole of his trip to Muli. only a variety of opium-sodden Nakhi, primitive Yi and aggressive 'Hsifan', ('western bandits', the name given to the Tiberans by the Chinese). 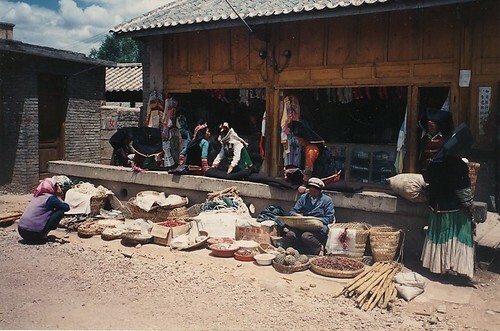 But now Youngning was a Chinese frontier town: a collection of log cabins around a market square, where Yi women traded a few wilting vegetables. And whereas Rock took advantage of 'the monastery and its hospitable shelter', I had to make do with the 'County Guesthouse': a breeze-block tower surmounted by a satellite dish which was part of the local Party headquarters. After I checked in I had a bizarre encounter with a young woman who wanted to entice me to have a shower with her. Whether she was a prostitute or just one of the staff trying to show me where the showers were, I'll never know. 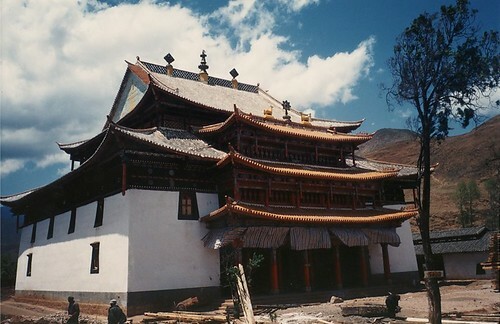 The Youngning monastery was still intact, but under renovation after falling into neglect. I paid a visit and wandered among the Tibetan workmen outside, looking for someone who looked vaguely like a monk. The foreman took me to one side and asked me what I wanted. 'Is it possible to walk from here to Muli?' I asked. 'Yes, but it is dangerous. It takes three days through high mountains. Even we dare not do it. You should go by bus instead, back through Ninglang and Yanyuan,' he said. But that would take too long, I thought, and I would probably get turned round by the police because Muli was closed to foreigners. The foreman led me away, to see the interior of the renovated temple. Within was a row of yellow-hatted gilded statues of former abbots, sitting lotus-position on multi-coloured thrones, surrounded by animals and flowers. A lone monk squatted on a cushion in a dark corner, banging a gong and chanting. To get a better view of my intended route, 1 climbed a thousand-foot high grassy hill behind the monastery. As I reached the top, which was cluttered with prayer flags, I saw snow-hound mountain peaks to the north-east. I almost jumped for joy: surely, those to the north were the Konkaling peaks? And those to the east must be near Muli monastery? And from Youngning below, there seemed to he a fairly straightforward route along the plain and over some low hills, to those Muli peaks. Now my intended trip looked possible, and I was happy. 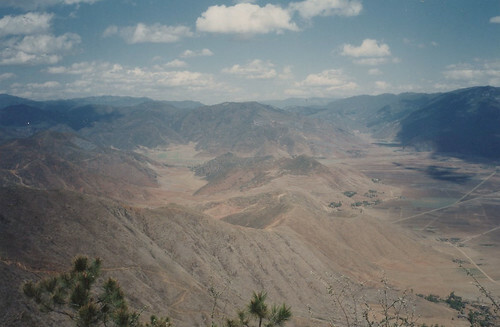 The doubts of Lugu Lake were all forgotten. That evening, in the blacked-out village, I sat in a restaurant celebrating my first sight of the Muli peaks, with a bottle of beer. 'What do you want to go to Muli for?' asked the Chinese waitress, when I told her my plans. 'The people there are poor and backward. There's nothing to see.' To me, it sounded encouraging. Chapter 28: WUJIAO: Guns and Rhododendrons. Chapter 29: MULI AT LAST. Chapter 30: WACHANG: The End Of My Quest.